the Alterra DVX 90, Alterra 90 and Alterra 150, plus the entry-level Alterra 300 for adults. deliver the durability and enjoyment that customers expect. The new 2018 Alterra 90 from Textron Off Road offers the same high quality and fun as the adult-sized Alterra models, but in a package that’s meant for youth riders. The Alterra 90 is built for Y-12 users (youth 12 years and older) compliant to stringent CPSC/SVIA standards, with features that include full floorboards, padded handlebars, removable keys, standard dual rear brake lights and headlights and an orange whip safety flag. 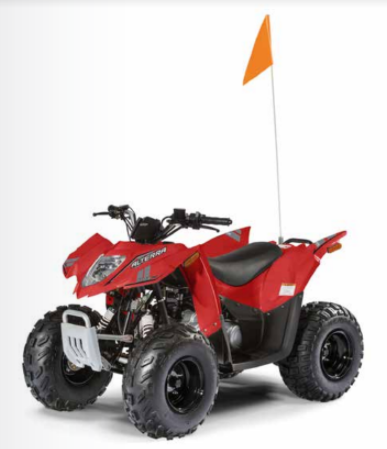 It’s powered by a 90cc, SOHC, 2-Valve, four-stroke engine with Duramatic automatic transmission, automatic choke and a 15mph speed governor, making it capable of powering youth and adults with an energetic, playful spirit. Parents and riders will appreciate that it comes with forward and reverse. 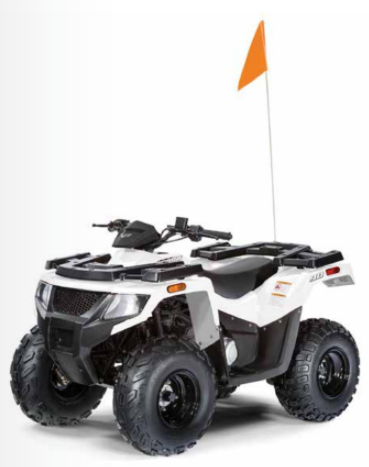 Its rugged independent front A-arm and rear swing arm suspensions deliver comfort, while hand-operated front and rear brakes keep it controlled. Start the fun when they’re young with the 2018 Alterra DVX 90 from Textron Off Road. Boasting great quality and fun and at value that can’t be beat, the DVX 90 is guaranteed to be a hit for youth riders and families who want to share the fun. The DVX 90 is built for Y-12 users (youth 12 years and older) compliant to stringent CPSC/SVIA standards, with features that include full floorboards, padded handlebars, removable keys, standard rear brake lights, and an orange whip safety flag. It’s powered by a 90cc, SOHC, 2-valve, 4-stroke engine with Duramatic automatic transmission, automatic choke and a 15 mph speed governor, making it capable of powering youth and adults with a playful spirit. Its rugged independent single A-arm front and rear swing arm suspensions deliver comfort, while hand-operated front and rear brakes keep it controlled. 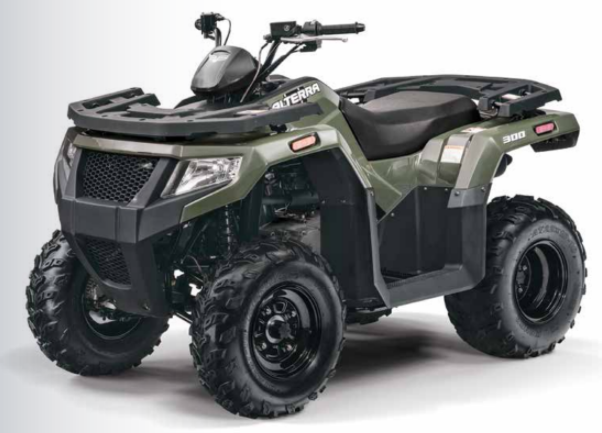 Introduce a youth rider to fun with the new 2018 Alterra 150 from Textron Off Road. 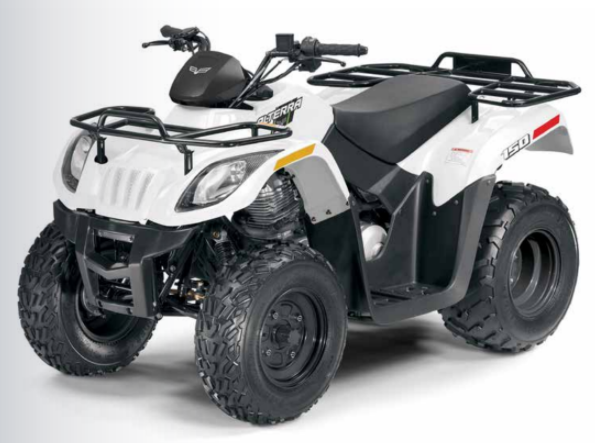 The 150 is a youth transitional ATV that delivers full-sized fun, handling and performance in a midsized package. It’s built with the T-14 rider rating for riders 14 years and older. The Alterra 150 is a two-wheel drive machine powered by a spirited 149cc, SOHC 4-stroke air-cooled engine that’s as rider-friendly as it is tough. A fully automatic CVT transmission simplifies driving, offering the ease of Forward, Neutral and Reverse. Hydraulic rear disc brakes deliver full stopping power, while fully enclosed shaft drive adds durability with no maintenance required. Its steel-framed chassis features an A-Arm front suspension and rear swingarm suspension, both with 3.5 inches of travel with the front dampened by 5-position adjustable shocks to handle a range of operator sizes and riding styles. Front drum brakes with rear hydraulic disk brakes provide positive, self- cleaning stopping power in all conditions with zero adjustment. Functional racks on the 4x2 model have a 25-pound front capacity and 50-pound rear rack capacity, while a digital instrument pod displays speedometer, odometer, trip meter, digital clock, coolant temperature, fuel gauge and indicator lights for neutral, reverse and high beam lights. Safety features include a governed top speed of 20 mph, but with the ability to reach 30 mph. The 2018 Alterra 300 from Textron Off Road delivers big features and capabilities at a small price. The Alterra name says it all, with the class-leading combination of suspension, load capacity, horsepower, comfort and quality for an overall experience that exceeds expectations for a two-wheel drive machine. The sculpted fenders, headlights and grille maximize ergonomics and durability, and are narrow enough to maneuver through the tight woods yet protect you from mud and water spray. Composite front and rear racks are impact-resistant and provide 50-pound/100-pound front/rear capacities. Full-length composite floorboards enhance surefooted traction while the low seat height increases rider comfort and control. The heart of the 300 is its spirited single-cylinder, liquid-cooled 270cc 4-stroke engine, which, combined with an automatic transmission and lightweight chassis, delivers an unstoppable force of fun. A backup engine fan delivers consistent cooling. And automatic CVT transmission provides High, Low and Reverse for maximum ease and usability. The ultra-tough chassis is lightweight in comparison to its mid- and full-sized competition, which translates into rider-friendly handling. It features dual A-arm front suspension and a swingarm-style rear, each boasting 5 inches of suspension travel. Ground clearance is 10 inches, which coupled with 22-inch front and rear Kenda Pathfinder tires on 10-inch rims, give riders the confidence to tackle any terrain. Standard equipment includes a 500-pound towing capacity; dual halogen headlights; hydraulic disc brakes; digital instrument pod and Start-In-Gear capability.